Major scale (1234567) has the tones composing major chord (135). Natural minor scale (1,2,♭3,4,5,♭6,♭7) has the tones composing minor chord (1,♭3,5). For your infomation, major scale and natural minor scale have the relationship as two sides. When starting 6th of major scale, it becomes natural minor scale. When starting ♭3rd of natural minor scale, it becomes major scale. Key is the most basic tone (or chord) in a track. For example, F tone is basic in F(F major) key, and Gm chord is basic in Gm(G minor) key. 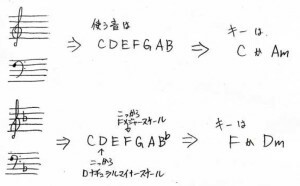 We can decide key, seeing ♭ or ♯ written at first area of music score. Like this. It’s OK to remember the above two, often played. And B♭ or Gm (having two ♭), E♭ or Cm (having three ♭) are also often played. We decide major or minor from the brightness of the track or the last chord. Let’s remember natural minor scale.